Business Class Internet from Xfiber will give your company high bandwidth and extreme availability at competitive prices, to allow you to leverage your Internet connection in the optimal manner. Our Internet services are supported by the strongest SLA agreement on the market. This is why a large number of companies base their entire operations on Internet access via Xfiber. As a Xfiber customer , you will be immediately impressed with our clear datacom services, simple sales process, very short installation time and our proactive customer service. This is why we have developed thousands of companies into loyal customers over 20 years. Internet Access from Xfiber gives you access to our “business grade” internet service, and includes our Xclusive SLA for all connections. 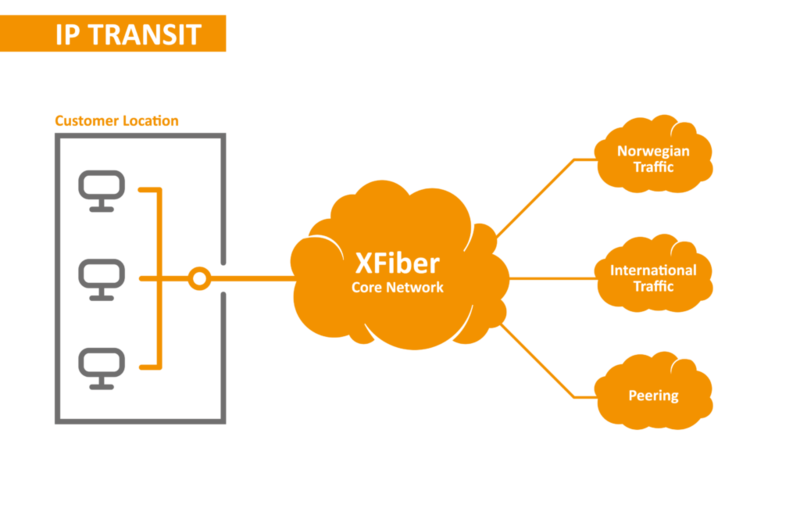 At any given time, Xfiber has at least 3 “data highways” out of Norway toward the large international data networks so that our customers are always connected to the Internet in the most efficient manner possible. One of the routes is via the North Sea to England, and is in other words independent of traffic via Oslo, Sweden and Denmark, which is the most common route. We deliver access to the Internet with standard bandwidths up to 10 Gbps, but in some areas we can supply even higher speeds. Xfiber has always had surplus capacity in its network, so we have been able to deliver Internet capacity to other operators and ISPs as well. An IP transit-service from Xfiber includes BPG routing and IP connectivity up to 10 Gbps and can be delivered in both Oslo, Bergen and Stavanger.At any given time, Xfiber has at least 3 “data highways” out of Norway toward the large international data networks so that our customers are always connected to the Internet in the most efficient manner possible. Our extensive core network is based on high-speed fiber all the way to the nearest datacom node. The last hundred or thousand metres are preferably delivered via fibre, but also via other technologies where fibre is not available or where a combination of technologies is wanted. Many customers want particularly robust Internet access with failover solutions that are activated if the primary link goes down for any reason. Along with the customer, Xfiber can design the optimum solution to ensure that the customer is always online. 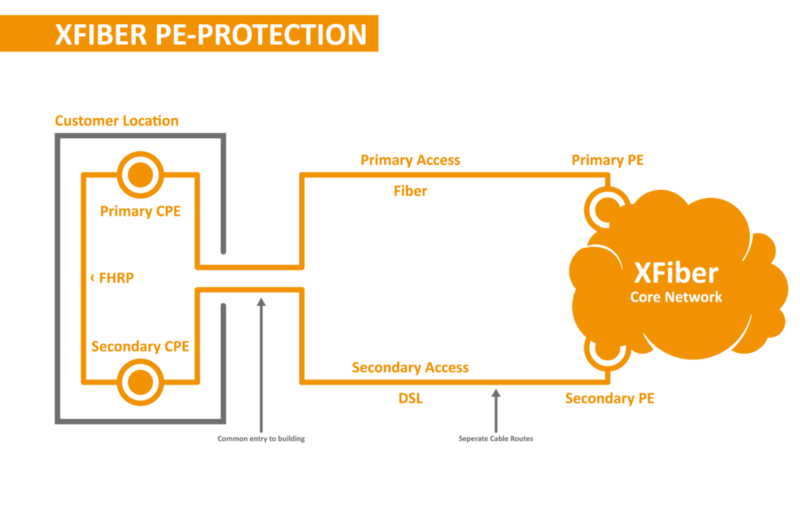 You can typically combine technologies where fibre is used as the primary communication medium with a copper-based DSL line as failover communication. You can also combine 2 different fibre lines that run in separate trenches into the customer’s offices. The technology which ensures that traffic is moved from the primary connection to failover communication is based on routers with HSRP support (Hot Standby Routing Protocol) or a multi-home BGP solution that requires some additional equipment and configuration. Our extensive core network is based on high-speed fibre all the way to the nearest datacom node. The last hundred or thousand metres are preferably delivered via fibre, but also via other technologies where fibre is not available or a combination is wanted. Contact us at 08095 or send inquiries to [email protected] , and we will contact you for a presentation of our solutions.